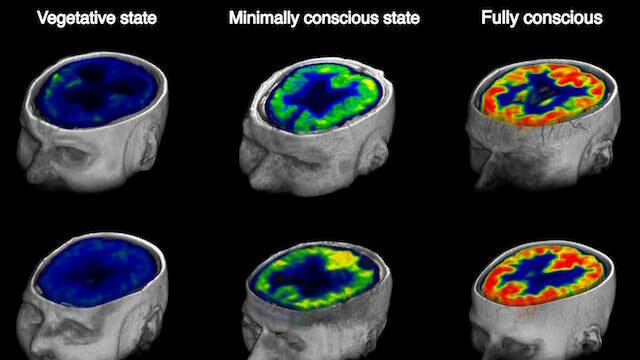 PET imaging of brain glucose metabolismSTENDERS ET AL.Differentiating states of consciousness in brain-injured patients is a major challenge for clinicians. Researchers from the University of Copenhagen, Denmark, and their colleagues recently used positron emission tomography (PET) to measure the metabolism of glucose in the brains of 131 patients, finding that 42 percent of normal cortical function is the minimum amount of energy required for conscious awareness. The findings provide “a simple and objective metabolic marker” of consciousness, the authors wrote in their study, published today (May 26) in Current Biology. 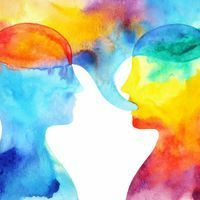 “[The study authors] distinguished a strong physical measurement of two different states of lowered consciousness beautifully, with excellent data,” Robert Shulman of Yale University, who reviewed the study, told The Scientist. “They did this by measuring the cerebral metabolic rate of glucose consumption using PET, [which is] a strong, reliable measurement,” he added. Previous studies have shown that brain glucose metabolism declines when consciousness is lost, but researchers did not have a quantitative measure for distinguishing between disorders of consciousness—such as coma, minimally conscious state (MCS), and the more severe unresponsive wakefulness syndrome (UWS). Ron Kupers of the University of Copenhagen and colleagues last year showed that MCS and UWS are associated with brain metabolic levels that are approximately half those of healthy adults in a small study of 41 patients. In the present study, Kupers and colleagues conducted PET imaging on 131 patients with disorders of consciousness and 28 healthy controls. This involves injecting glucose labeled with a radioactive tracer into the bloodstream to measure sugar uptake in an organ—in this case, the brain. 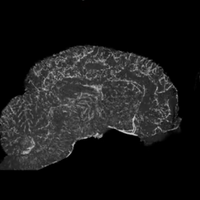 To account for differences among individuals, the researchers normalized glucose uptake in the brain with that of surrounding tissue. Kupers’s team identified a sharp cutoff for regaining consciousness of 42 percent of the normal, healthy metabolic rate. 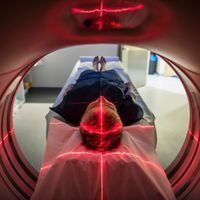 One year after the PET study, the brain’s metabolic rate predicted the return of awareness for 94 percent of the patients in the study, the researchers reported. In addition, regional differences in glucose metabolism (relative to whole-brain metabolism) correlated with the patients’ likelihood of regaining certain cognitive functions, such as vision and language comprehension, the team showed. Previous studies have attempted to quantify levels of consciousness of patients under varying doses of anesthesia, but Kupers and colleagues are the first to compare different types of pathologies, Shulman said. “To get 130 patients into a PET machine, classify them, and end up with such a clean separation of [conscious states] is really marvelous,” he said. “While this study may be perfectly correct that a threshold of 42 percent of normal cortical hemispheric metabolic activity represents the minimal energetic requirement predictive of regaining consciousness, this does not imply that this is a sufficient condition,” Christof Koch, president and chief scientific officer of the Allen Institute for Brain Science in Seattle, who was not involved in the study, wrote in an email to The Scientist. Other conditions, such as a sustained heartbeat, must also be met. “Furthermore, you can have high metabolic metabolism and still be not conscious,” Koch added, as is the case in patients with status epilepticus (a condition characterized by sustained or repeated seizures) or alpha coma (a coma state where alpha brain waves are preserved). More studies are needed to tease apart these nuances, and to verify the findings in other patient populations. J. Stender et al., “The minimal energetic requirement of sustained awareness after brain injury,” Current Biology, doi:10.1016/j.cub.2016.04.024, 2016.